The 1990 Americans with Disabilities Act (ADA) prohibits discrimination against individuals with disabilities in every area of public life, including employment, education, transportation, telecommunications and all public and private places that are open to the general public. As professional communicators, we work closely with our clients to help them craft messages to reach their target audiences. With the continuing evolution of web-based communications, the need to adapt the message for each target audience is a growing challenge. For healthcare communicators, making sure important information can be accessed and understood by as many people as possible is critical. Many of us are familiar with some of the most common changes fostered by the ADA – door ramps, public restroom accommodations, and special wheelchair lifts on public buses, to name a few. 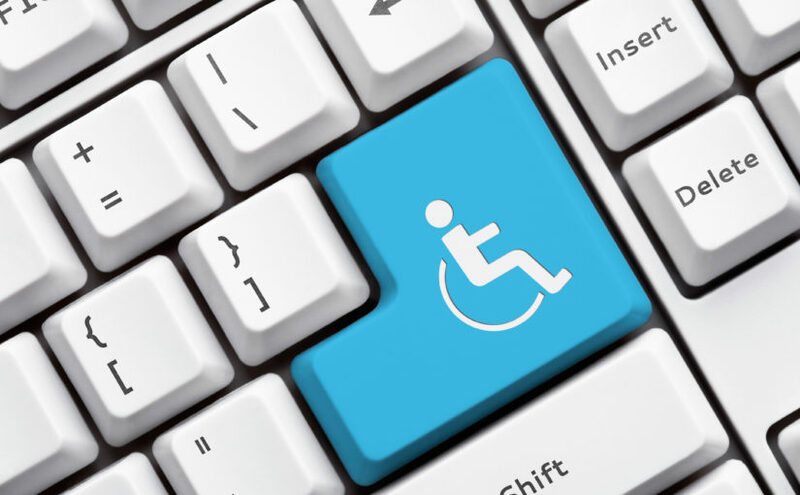 But the ADA has also played a key role in the evolution of online commerce, by trying to ensure that the disabled have equal access to goods, services and digital content on websites operated by businesses and other organizations. As part of a recent webinar sponsored by the New England Society for Healthcare Communicators (@NESHCo), presenters from @SilverTech, a digital marketing firm, noted that the federal government often serves as a catalyst for changes that are adopted throughout industries. Several prominent legal cases have helped further the cause of greater website accessibility for the disabled. National Federation of the Blind v. Target Corp. was a class action suit brought against the retailer because blind consumers could not navigate the Target website and make purchases as readily as a non-disabled consumer could. The result: The court found the ADA’s prohibition against discrimination in the “enjoyment of goods, services, facilities or privileges” applied to public accommodations in cyberspace as well as a physical retail store. In National Association of the Deaf v. Netflix, Netflix was found to have violated ADA protections because it failed to provide closed captioning for its “Watch Instantly” digital content. The case confirmed that businesses that sell services exclusively through the internet were also subject to ADA provisions that protect disabled citizens against discrimination. In 2014, an agreement negotiated between the Justice Department and Peapod, an internet grocer, further solidified the scope of the ADA’s reach, by emphasizing the importance of ensuring websites are equally accessible via mobile devices. These recent cases may be the beginning of many more website accessibility cases. That means pressure on organizations to ensure that digital content on their websites and affiliated technology are independently accessible, regardless of whether the user is working from a laptop, smartphone or other mobile device. Healthcare organizations and financial institutions – because they tend to be highly transactional – may be particularly vulnerable to potential ADA accessibility litigation. For example, for consumers who use a hospital website to find a physician, look up services, identify locations – any such type of direct engagement – the information should be as accessible as if the consumer were entering the facility itself. Making sure one’s website is accessible to people with disabilities not only protects against ADA-related litigation, it also enhances the search optimization of your site. The basic idea of the internet has always been to provide information in as accessible a fashion as possible. By limiting accessibility, you run the risk of cutting off customers and potential markets. Thus, it’s important for organizations to follow best practices to ensure their websites’ accessibility is constantly maintained. The Web Accessibility Initiative (WAI) of the World Wide Web Consortium (WC3), the primary international standards organization for the internet, has published a series of web accessibility principles to help organizations keep their websites current. The thrust of the Web Content Accessibility Guidelines 2.0 (WCAG) can be remembered by using the acronym P.O.U.R. P is for Perceivable. All digital content and user interface components should be presented to users in different ways to account for different means of perception. For example, digital content should provide text alternatives to non-text content. Multimedia should have captions or other alternatives to explain the action that is taking place. Assistive technologies should be integrated where possible, so that meaning isn’t lost. Also, enabling users to see and hear – rather than just read – content is a plus. Consider offering transcripts of podcasts. If your website includes video, provide visual access to audio information through in-sync captioning. Also, don’t rely on color as a navigational tool or as the only way of distinguishing items. O is for Operable. Websites should be designed so interface components and navigation is easily operable (e.g., via keyboard or mouse), and tagged to work with voice control systems. The interface should assist users in navigating and finding digital content, and also give users enough time to read and use it. Including a skip navigation feature can make it easier for automatic screenreaders to make sense of on-screen content. R is for Robust. Content should be robust enough that it can be interpreted by a wide range of user applications, including assistive technologies. Compatibility with current and future user tools should be an ongoing goal. The internet’s continuing evolution as a primary source of commerce, entertainment, information and services has changed the way business, government and society operate. Those with disabilities may find that some websites don’t provide the level of access they need to partake of information, products or services that are presented on their websites. Organizations, particularly those in healthcare, need to maximize their efforts to ensure that anyone, regardless of a disability, can easily navigate their websites and access the digital content they need. Doing so will help forestall ADA-related litigation. But it will also enhance the basic navigability and SEO compatibility of the website.